Black Langshans are also from the Asiatic Class of poultry and are a pure breed that originated in China many years ago. These large stunning birds are pure glossy black with bright red combs, dark eyes, and black shanks. 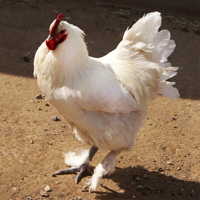 White Langshans are a large stately appearing chicken. Originating in China, these beautiful birds are pure white when mature with dark brown eyes and slatey blue shanks. The chicks are dark gray to smoky white.